If you have a template source spectrum, you may wish to predict the calibrated flux densities that would be reported in the various Spitzer bands (e.g. IRAC 3.6, 4.5, 5.8, 8.0 microns; IRS Peakup Imaging 16, 22 microns; MIPS 24, 70, 160 microns). This can be useful, for instance, in deriving photometric redshifts. After introducing the relevant basic concepts, this section provides step-by-step instructions for determining synthetic, calibrated IRAC, IRS, and MIPS photometry from such a template. In this section we have collected information which will be useful to those who wish to compute synthetic Spitzer photometry. 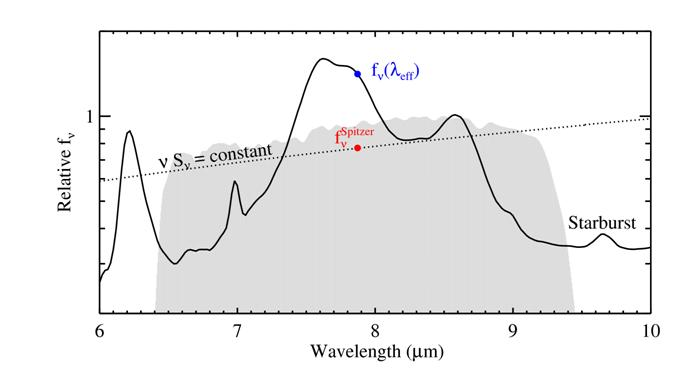 We also provide IDL code (only tested on IDL version 6.3) which can calculate synthetic fluxes for smooth spectra (generally not pure emission lines). Examples using the code are provided. The IDL code is available on the SSC web site here: http://irsa.ipac.caltech.edu/data/SPITZER/docs/dataanalysistools/cookbook/files/spitzer_synthphot_28Oct2008.tar.gz. Among the files you just unpacked are the filter response files (ending in .txt and .dat). These are assumed to be in your working directory in the following examples. Note that this IDL code provides good agreement with the values tabulated in the IRAC, MIPS and IRS Instrument Handbooks. The results are consistent to within half a percent. The fact that the values are not exactly the same is likely due to differences in the interpolation and integration methods used. The differences in color correction are comparable to the errors in the measurement of the spectral response curves and will be less than the systematic error due to real differences between the assumed spectral shape and the observed object. Note that this IDL code computes color corrections for the IRS peak-up filters as calibrated in pipeline versions S17 and greater. It is not to be used for data reduced with older versions of the pipeline. There are three quantities that are essential for understanding how to perform synthetic photometry for the Spitzer instruments on a given template spectrum. λeff: This is the effective wavelength of the filter. These are defined and tabulated for each Spitzer instrument in the step-by-step guides below. n(λeff): This is the monochromatic (measured at the effective wavelength of the filter) flux density of the template spectrum. results in the same observed counts as the template source. Thus, νSpitzer = ν(λeff) if the template spectrum has the standard spectral shape. However, significant deviations can occur if the template, or source, spectrum is very different than the standard, or reference, spectrum. K: This is the color correction, which relates the above two quantities according to: . The color correction is computed in a different way for each of Spitzer's imagers (see the step-by-step guides below). It requires knowledge of 1) the source spectrum, 2) the reference spectrum, and 3) the filter response. The IDL code used to create the above graph is available on the Spitzer web site here: http://irsa.ipac.caltech.edu/data/SPITZER/docs/dataanalysistools/cookbook/files/spitzer_synthphot_example.pro. The filter response curves are given in units of electrons per unit energy for MIPS and in units of electrons per photon for IRAC and IRS. Therefore, the equation used to calculate the color correction from the provided response function is different for MIPS than for IRAC and IRS. These differences are outlined in the step-by-step procedures provided below for each instrument. The reference spectrum has the shape of a 10,000K blackbody for MIPS and that of a flat spectrum (nSν = constant) for IRAC and IRS. In modern astronomical literature there are several reference systems in common use (SI, CGS, Jy, AB, Vega, etc). Each of these systems adopts a different reference spectrum. We have noted above that the IRAC and IRS systems adopt a reference spectrum described by νSν = constant, while the MIPS system is based on a 10,000 Kelvin blackbody. In constrast, the AB and Jansky systems assume νSν = constant, while the Vega system uses a spectrum of Vega, of which there are several different versions. You may wish to put your Spitzer photometry on one of these other systems. You can use the basic concepts on this page to do so. However, be aware that the choice of a reference spectrum affects the effective wavelength. When reporting photometry, the effective wavelength of the output system should be indicated. These will in general differ from the effective wavelengths presented on this page. 9.3.1 Determine your input spectrum. If you are going to calculate the correction using the IDL code, this should be in Janskys (i.e. energy flux per unit frequency) as a function of wavelength (ν(λe)). The input spectrum should cover the width of the IRAC filter profile, so long as it has flux there. It should not be zero at the effective wavelength, and thus should generally not be a pure emission-line spectrum. 9.3.2 Estimate the flux density of the input spectrum at the effective wavelength. 9.3.3 Determine the color correction, which for IRAC is defined by the following equation. Here, Sν(λeff) is the reference spectrum evaluated at the effective wavelength; ν(λeff) is the template spectrum evaluated at the effective wavelength; and Rγ(ν) is the filter response function as a function of frequency in units of electrons per photon. Note that this expression is equivalent to equation 4.8 in the IRAC Instrument Handbook. B. You can calculate the color correction using the IDL code as follows. ii. Note that the IRAC response curves are provided in units of electrons per photon! The subscript γ is supposed to remind you of this. iii. Load the spectral response into IDL variables, e.g. filter_w (microns) and filter_t, like the 1st IDL line in Step 1 above. Load the template spectrum into, e.g. wave (microns) and spec_fnu (Jy). iv. Calculate the color correction. Note that the downloadable IDL code provides good agreement with the values tabulated in Section 4.4 of the IRAC Instrument Handbook for various types of science spectra. The results are consistent to within half a percent. The fact that the values are not exactly the same is likely due to differences in the interpolation and integration methods. 9.3.4 Calculate the calibrated Spitzer flux density using the following equation. 9.4.1 Determine your input spectrum. If you are going to calculate the correction using the IDL code, this should be in Janskys (i.e. energy flux per unit frequency) as a function of wavelength ν(λ). The input spectrum should cover the width of the IRS Peakup filter profile, so long as it has flux there. It should not be zero at the effective wavelength, and thus should generally not be a pure emission-line spectrum. 9.4.2 Estimate the flux density of the input spectrum at the effective wavelength. We can also estimate ν(λeff), the flux density of the input spectrum at λeff. 9.4.3 Determine the color correction, which for the IRS is defined by the following equation. A. If your input spectrum is well-described by a blackbody or power-law over the IRS filter of interest, you can estimate the color correction from the tables in section 4.2.3.2 of the IRS Instrument Handbook. Note that the IRS response curves are provided in units of electrons per photon! The subscript γ is supposed to remind you of this. ii. Load the spectral response into IDL variables, e.g. filter_w (microns) and filter_t, like the 1st IDL line in Step 1 above. Load the template spectrum into, e.g. wave (microns) and spec_fnu (Jy). iii. Calculate the color correction. Note that the downloadable IDL code provides good agreement with the values tabulated in the tables in section 4.2.3.2 of the IRS Instrument Handbook for various types of science spectra. The results are consistent to within half a percent. The fact that the values are not exactly the same is likely due to differences in the interpolation and integration methods. Note that this IDL code computes color corrections for the IRS peak-up filters as calibrated in pipeline versions S17 and greater. It is not to be used for data reduced with older versions of the pipeline. 9.4.4 Calculate the calibrated Spitzer flux density using the following equation. 9.5.1 Determine your input spectrum. If you are going to calculate the correction using the IDL code, this should be in Janskys (i.e. energy flux per unit frequency) as a function of wavelength. The input spectrum should cover the width of the MIPS filter profile, so long as it has flux there. It should not be zero at the effective wavelength, and thus should generally not be a pure emission-line spectrum. 9.5.2 Estimate the flux density of the input spectrum at the effective wavelength. Also we can estimate ν(λeff), the flux density of the input spectrum at λeff. 9.5.3 Determine the color correction, which for MIPS is defined by the following equation. Here, Sν(λeff) is the reference spectrum evaluated at the effective wavelength; ν(λeff) is the template spectrum evaluated at the effective wavelength; and R(ν) is the filter response function as a function of frequency in units of electrons per unit energy. Since the MIPS response is in different units than the IRAC and IRS response functions, the equation for the color correction is different. If your input spectrum is tabulated in Section 4.3.5 of the MIPS Instrument Handbook, you can use the color correction from the tables. You can calculate the color correction using the IDL code as follows. Note that the MIPS response curves are provided in units of electrons per unit energy! D. Load the spectral response into IDL variables, e.g. filter_w (microns) and filter_t, like the 1st IDL line in Step 1 above. Load the template spectrum into, e.g. wave (microns) and spec_fnu (Jy). E. Calculate the color correction. Note that the downloadable IDL code provides good agreement with the values tabulated in Section 4.3.5 of the MIPS Instrument Handbook for various types of science spectra. The results are consistent to within half a percent for 24, 70, and 160 microns. The fact that the values are not exactly the same is likely due to differences in the interpolation and integration methods. 9.5.4 Calculate the calibrated Spitzer flux density using the following equation.